In the British Empire (most of which became the Commonwealth), high commissioners were envoys of the Imperial government appointed to manage protectorates or groups of territories not fully under the sovereignty of the British Crown, while Crown colonies (British sovereign territories) were normally administered by a governor, and the most significant possessions, large confederations and the self-governing dominions were headed by a governor-general. For example, when Cyprus came under British administration in 1878 it remained nominally under the suzerainty of the Ottoman Empire. The representative of the British government and head of the administration was titled high commissioner until Cyprus became a Crown colony in 1925, when the incumbent high commissioner became the first governor. Another example were the high commissioners for Palestine. A high commissioner could also be charged with the last phase of decolonisation, as in the Crown colony of the Seychelles, where the last governor became high commissioner in 1975, when self-rule under the Crown was granted, until 1976, when the archipelago became an independent republic within the Commonwealth. As diplomatic residents (as diplomatic ranks were codified, this became a lower class than ambassadors and high commissioners) were sometimes appointed to native rulers, high commissioners could likewise be appointed as British agents of indirect rule over native states. Thus high commissioners could be charged with managing diplomatic relations with native rulers and their states (analogous to the resident minister), and might have under them several resident commissioners or similar agents attached to each state. In regions of particular importance, a commissioner-general was appointed to have control over several high commissioners and governors, e.g. the commissioner-general for South-East Asia had responsibility for Malaya, Singapore and British Borneo. The first high commissioner of India to London was appointed in 1920; he had no political role, but mostly dealt with the business interests of 'Indian Federation'. The first agent of the Indian government was appointed to South Africa in 1927. 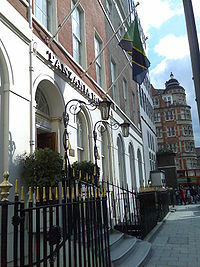 Although not a dominion, the self-governing colony of Southern Rhodesia was represented in the United Kingdom by a high commission in London, while the United Kingdom similarly had a high commission in Salisbury. Following the Unilateral Declaration of Independence by the government of Ian Smith in 1965, the Rhodesian high commissioner, Andrew Skeen was expelled from London, while his British counterpart, Sir John Johnston, was withdrawn by the British government. The role of high commissioner for Southern Africa was coupled with that of British governor of the Cape Colony in the 19th century, giving the colonial administrator in question responsibility both for administering British possessions and relating to neighbouring Boer settlements. Historically, the protectorates of Bechuanaland (now Botswana), Basutoland (now Lesotho) and Swaziland were administered as high commission territories by the Governor-General of the Union of South Africa who was also the British high commissioner for Bechuanaland, Basutoland, and Swaziland until the 1930s, with various local representatives, then by the British high commissioner (from 1961 ambassador) to South Africa, who was represented locally in each by a resident commissioner. The British Western Pacific Territories were permanently governed as a group of minor insular colonial territories, under one single, not even full-time, Western Pacific high commissioner (1905–53), an office attached first to the governorship of Fiji, and subsequently to that of the Solomon Islands, represented in each of the other islands units: by a Resident Commissioner, Consul or other official (on tiny Pitcairn Islands a mere chief magistrate). The high commissioner to New Zealand ex officio is the governor of the Pitcairn Islands. The first dominion high commissioner was appointed by Canada as its envoy in London. Previously, Sir John Rose, 1st Baronet, a Canadian businessman resident in London and former Canadian finance minister, had acted as the personal representative of the Canadian prime minister Sir John A. Macdonald, from 1869 to 1874 and then was given the title of Financial Commissioner from 1874 until 1880. Alexander Mackenzie, while he was prime minister, appointed Edward Jenkins a British Member of Parliament with links to Canada, to act as the government's representative in London as agents-general (1874–1876), followed by former Nova Scotia premier William Annand (1876–1878). When Macdonald returned to power in 1878 he requested to elevate the position of financial commissioner to resident minister, but was denied the request by the British government who instead offered to allow the designation of high commissioner. The Canadian government appointed Alexander Tilloch Galt as the first high commissioner of Canada to the United Kingdom in 1880. New Zealand appointed a high commissioner in 1905, in place of a resident agent-general which have been appointed since 1871. Australia did the same in 1910, and South Africa in 1911. The British government continued not to appoint high commissioners to the Dominions, holding that the British government was already represented by the relevant governor-general or governor. This arrangement began to create problems after the First World War with Dominions expecting a greater degree of control over their external and foreign affairs and beginning to challenge the constitutional role of their governors-general. In Canada, matters came to a head during the King–Byng affair of 1926, when the governor-general refused the advice of the Canadian prime minister to dissolve parliament and call elections, as would normally apply under the Westminster system. The incident led to the Balfour Declaration made at the Imperial Conference of 1926 that established that governors-general in the independent Dominions were not the representatives of the United Kingdom government but the personal representatives of the monarch. In 1930, Australia broke another tradition by insisting that the monarch act on the advice of the Australian prime minister in the appointment of the governor-general, and insisted on the appointment of Sir Isaac Isaacs, the first Australian-born person to serve in the office. The practice became the norm throughout the Commonwealth. The first British high commissioner to a dominion was appointed in 1928 to Canada. South Africa received a British high commissioner in 1930; Australia in 1936; and New Zealand in 1939. The first high-ranking official envoy from one dominion to another was appointed by South Africa to Canada in 1938. Yet, because of various procedural complications, only in 1945 was South African envoy to Canada designated officially as high commissioner. New Zealand appointed a high commissioner to Canada in 1942, and a high commissioner to Australia in 1943. From the 1930s, some Commonwealth countries indicated a preference for the title to be replaced with that of ambassador, but over the years whenever the issue was raised, a majority of members were in favour of keeping the separate title and status of high commissioner. As sixteen Commonwealth members, known as the Commonwealth realms, share the same monarch as head of state (currently Her Majesty Queen Elizabeth II), diplomatic relations between these countries are traditionally at a governmental level. In diplomatic usage, a high commissioner is considered equivalent in rank and role to an ambassador. A high commissioner from one Commonwealth realm to another carries a simple and often informal letter of introduction from one head of government (prime minister) to that of another, host country, while ambassadors carry formal letters of credence from their head of state addressed to the host country's head of state. The difference in accreditation is also reflected in the formal titles of envoys to Commonwealth and non-Commonwealth states: e.g., British high commissioners to the Commonwealth countries are formally titled "The High Commissioner for Her Majesty's Government in the United Kingdom", whereas British ambassadors to non-Commonwealth countries are known as "Her Britannic Majesty's Ambassador". For historical reasons, high commissioners are also appointed even in the case of republics in the Commonwealth and indigenous monarchies (e.g. the kingdoms of Tonga, Swaziland, etc., who have monarchs other than the reigning British monarch) within the Commonwealth. In this case, letters of commission are usually issued by one head of state and presented to the other. However, some Commonwealth governments may choose to use the more informal method of issuing prime-ministerial letters of introduction, while other governments have opted instead for letters of credence. Instead of embassies, the diplomatic missions of Commonwealth countries are called high commissions, although it is possible for a country to appoint a high commissioner without having a permanent mission in the other country: e.g. the British high commissioner in Suva, Fiji, is also accredited as high commissioner to Kiribati, Tuvalu and Tonga. Zimbabwe, as a Commonwealth country, traditionally had high commissioners in other Commonwealth countries. When it withdrew from the Commonwealth, it changed the style of its high commissions to embassies. Outside the capital, practice is less standard. Subordinate commissioners or deputy high commissioners may be appointed instead of consuls, and the commissioner's mission may be known as a consulate, commission or deputy high commission. Historically, in British colonies, independent Commonwealth countries were represented by commissions. For example, Canada, Australia and New Zealand maintained commissions in Singapore, while following its independence in 1947, India established commissions in Kenya, Trinidad and Tobago, and Mauritius which became high commissions on independence. Similarly, when Hong Kong was under British administration, Canada, Australia New Zealand India, Malaysia and Singapore were represented by commissions, but following the transfer of sovereignty to China in 1997, these were replaced by consulates-general, as in other non-capital cities in non-Commonwealth countries, with the last commissioner becoming the first consul-general. Canada formerly had a commissioner to Bermuda, although this post was held by the consul-general to New York City, but there is now an honorary Canadian consulate on the island. Despite the differences in terminology, Commonwealth high commissioners have, since 1948, enjoyed the same diplomatic rank and precedence as ambassadors of foreign heads of state, and in some countries are accorded privileges not enjoyed by foreign ambassadors. For example, the British Sovereign receives high commissioners before ambassadors, and sends a coach and four horses to fetch new high commissioners to the palace, whereas new ambassadors get only two horses. High commissioners also attend important ceremonies of state, such as the annual Remembrance Sunday service at the cenotaph in Whitehall (commemorating Commonwealth war dead) and royal weddings and funerals. ^ Archives, The National. "The Discovery Service". discovery.nationalarchives.gov.uk. Retrieved 18 March 2018. ^ MacLaren, Roy (18 March 2018). "Commissions High: Canada in London, 1870-1971". McGill-Queen's Press - MQUP. Retrieved 18 March 2018 – via Google Books. ^ "Embassies - Commonwealth of Nations". commonwealthofnations.org. Retrieved 18 March 2018. ^ "The Canadian Commission to Bermuda". international.gc.ca. Retrieved 18 March 2018. ^ "Canada's One-Time Bermuda Diplomat Dies - Bernews". bernews.com. 23 November 2011. Retrieved 18 March 2018. History of the title High Commissioner – "What's in a name?" – The curious tale of the office of High Commissioner, by Lorna Lloyd. The Commonwealth – UK government site. The Post of High Commissioner, The Monarchist, THURSDAY, 22 May 2008.